I guess it's time to blog again since I haven't done so in a couple of weeks! Out of everything I've seen from the spring 2016 cycle, Kiznaiver is probably one that I've enjoyed the most from beginning to end. Kiznaiver takes an interesting approach on showcasing the meaning of friendship, bonds and sentiment by combining individuals from different walks of life to create a story. It's a formula that's quite common from anime to anime, but it's put to good use in Kiznaiver. Everyone wants a select number of individuals as a part of their lives in one way or another, it's something I think everyone craves- I'm talking about genuine friends, not acquaintances. The people who I've opened myself up to, and in return they've opened themselves up to me, have never really left my life. All of that may sound way too deep but the main plot of Kiznaiver is mainly about how seven individuals come together, each having some sort of character flaw, find a way to develop a level of affinity towards one another. Set in Sugomori, a girl by the name of Noriko Sonozaki brings together seven individuals: Niko Niiyama, Katshuhira Agata, Chidori Takashiro, Honoka Maki, Yoshiharu Hisomu, Hajime Tenga and Tsuguhito Yuta to take part in an experiment known as the Kizna system. The seven participants are known as "Kiznaivers." 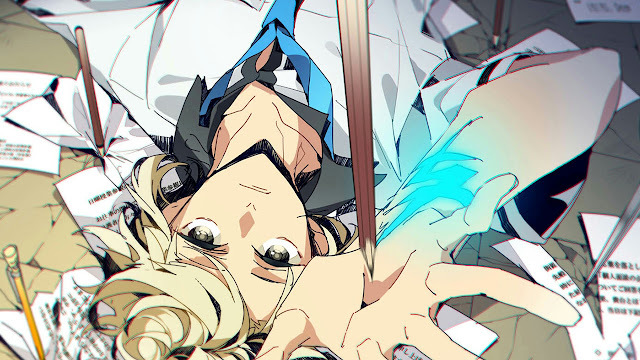 The experiment binds the seven individuals through a magical surgical procedure, so that when one person experiences physical pain, the pain is dispersed and felt by every Kiznaiver. As the bonds between the seven grow stronger emotional pain can be felt throughout all the Kiznaivers. It's a unique plot that stuck out for me and as I was watching the anime, although it's fiction, there was a good amount of validity behind the concept of friendship and bonding that tends to be pounded in each episode. In the anime we see the Kiznaivers placed in these insane quests where in some shape or form their character flaws are "revealed" and the Kiznaivers work together to try and mend whatever emotional wound that was never really "healed," so to say. Personally I enjoyed seeing each Kiznaiver character flaw play out with each episode, and how everyone works together to try and assist each other out. Kiznaiver did a great job at displaying how emotional strides, and sharing the sides of you that you don't want to be shared with people, whether it be with your friends or family, is really the key to enhancing the any relationship with the people you want that long lasting bond with. 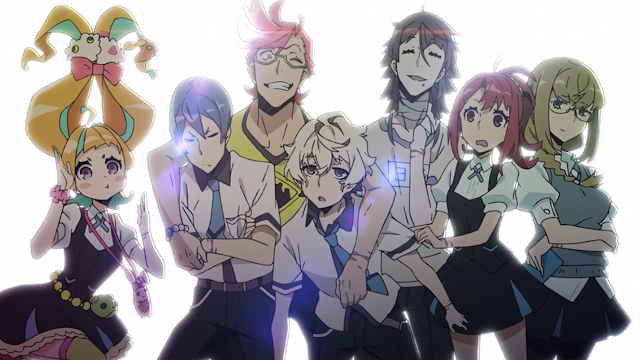 I'm at the point in my life where I realize it's important to stay somewhat connected with those who've you shared a lot with- and Kiznaiver was a great reminder of that. Out of everyone's storyline Honoka's storyline was my favourite, I enjoyed seeing her go from this standoffish, hardheaded person to being more open to others by the end of the anime. In terms of the cast and characters, surprisingly none of the Kiznaivers got under my skin. If anything I loved most of the Kiznaivers. Everyone gets a good amount of character development, even within 12 episodes, and it's a cast of... unusual people, so that makes it fun to watch. They all love throwing each other funny shade, which I'm all here for. The only issue I had was with Chidori, I rolled my eyes at times when I saw her jealously pour out- but given her circumstances it's all reasonable I guess. If you've seen the anime, naturally the first thing you would notice about Kiznaiver is it's amazing art and animation. I'm an art connoisseur, I loved every aspect of the animation in this anime- so kudos to Trigger on doing a job well done. I loved the composition of the stills during certain scenes, the designs of the characters and the beautiful colouring of the characters along with the well put together colouring of the surroundings. On the flip side, music and sound weren't the greatest. The OST of Kiznaiver wasn't something I paid much attention to- not that I really cared for the music while watching this anime anyways. However the music didn't really stick to my ears, as with many others I assume. The songs from the OST had a very... earthy, meek, bohemian feel to it- a good fit for the anime since Kiznaiver wasn't that huge on shock value and crazy antics. Besides all of that I was surprised that I got a good number of laughs from watching this anime. Although the anime isn't branded as a comedy, there were some fabulous one liners and hilarious moments in the anime. I got a bit giddy watching the Kiznaivers verbally banter against one another at times, and the never ending fat jokes against Yuta were always gold. Overall I loved my experience watching Kiznaiver. I rarely say this but if I do get the chance and if I ever would consider re-watching an anime, Kiznaiver would most likely be at the top of that list. Kiznaiver is an awesome anime about friendship so watch it if you have not seen it yet. If you've seen Kiznaiver please leave a comment down below and tell me your thoughts on the anime, or tell me what you thought about my thoughts!